We’ve all thought, heard or repeated that saying or something similar. Especially around each New Year. It’s true, some things old should never be replaced, such as universal moral laws found in Scripture. Or time-honored Biblical traditions such as marriage between one man and one woman. In that regard, old should not be equated merely with the long passage of time. Which is, unfortunately, how many people think. Meaning that anything that is more than say one hundred years in duration doesn’t fit in today’s world. It’s Old. It’s irrelevant. It’s archaic. It’s obsolete. Something new needs to take its place. Fix it, even if it’s not broke. Change for the sake of change, even if it’s not better. Just so it’s different! On the opposite extreme are those who refuse to give up old traditions and customs no matter what … no matter how much better a new way could be. To those folks, almost anything new is merely different, not (necessarily) better. Indeed, new is always different, but not always better. But never with God and his plan for Israel and the whole human race. As demonstrated throughout Scripture, whenever the Lord changes something and initiates something new, it’s ALWAYS for the better. How could it not be? The last time I checked, God is still perfect in every way. That’s the only way he does things; perfectly, though it may not seem so at the time. Ultimately, that sovereign perfection will make all things right in this woefully imperfect world of ours. The waiting time is getting shorter by each passing day. Although God changes things (for the better), he, himself, never changes. Nor does his Son; because with the Lord the saying is eternally true: Like Father, like Son. 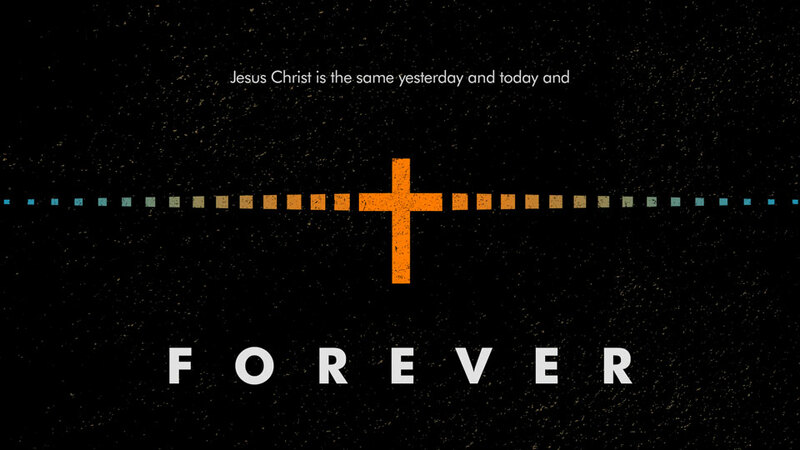 “Jesus Christ is the same yesterday, today, and forever” (Hebrews 13:8). Among other things, this attribute of the Lord is what makes him wonderfully worthy of our trust and praise. This is particularly true with God’s covenants to both Jews and Gentiles. Obviously, each covenant was new when initiated; yet there was only one covenant that actually replaced another one, i.e. the New Covenant of Grace for the old Mosaic Covenant of the Law. Because God is timeless, the past, present, and future are the same to him. For that reason God’s view of what is old has nothing to do with the passage of time. Instead, what is old to God and accordingly presented through God’s Word, the Bible, is simply that which is previous … the former as opposed to the latter. And, so should it be with us. As much as our finite minds can fathom it, we, too, need to think in terms of timeless eternity when it comes to absolute ancient truth. So when Jesus Christ came to this earth as God’s chosen Messiah at the perfect appointed time, his sacrificial life, death, burial, and resurrection applied timelessly to the past, present, and future. Unlike the Levitical sacrifices that needed to be offered continually, Messiah’s atoning sacrifice of his own body was the final, once for all sacrifice. In that regard it was the new replacing the old, but still part of God’s timeless plan for mankind. Thus, it shouldn’t come as a surprise to a lot of folks that the Lord, who among many other divine titles is called The Ancient of Days, is not opposed to some things new. “…Look, I am making everything new!” (Revelation 21:5a). And before that, Revelation’s author, John, tells us: “Then I saw a new heaven and a new earth, for the old heaven and old earth had disappeared. And the sea was also gone. And I saw the holy city, the new Jerusalem, coming down from God out of heaven like a bride beautifully dressed for her husband” (Revelation 21:1-2). “…Look, God’s home is now among his people! He will live with them, and they will be his people. God himself will be with them. He will wipe away every tear from their eyes, and there will be no more death or sorrow or crying or pain. All these things are gone forever” (Italics for emphasis). Now that gives a whole new meaning to new and it’s so much better! Wouldn’t you agree? In the context of God separating the Jews (Israel) as his chosen people long ago through Abraham, who are God’s people in the verses we just read? The answer is abundantly clear from dozens of other passages mostly in the New Testament, but also the Old Testament. They are both Jews and Gentiles who have entered the New Covenant prophesied by Jeremiah some 2,500 years ago. Over five hundred years later, Messiah Jesus—Son of God, Son of David, Son of Man—initiated that covenant with his life’s blood poured out on the Cross, then ratified the Covenant forever by his resurrection from the dead! “For Christ himself has brought peace to us. 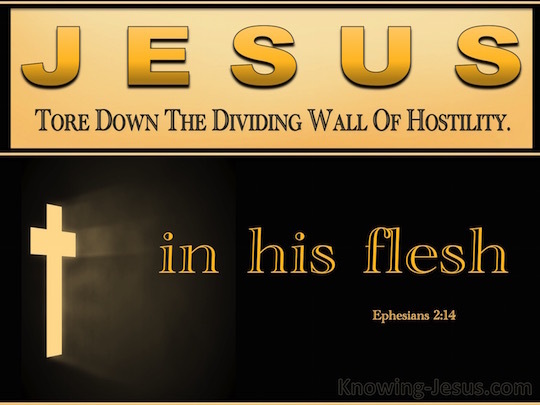 He united Jews and Gentiles into one people when, in his own body on the cross, he broke down the wall of hostility that separated us. He did this by ending the system of law with its commandments and regulations. He made peace between Jews and Gentiles by creating in himself one new people from the two groups. Together as one body, Christ reconciled both groups to God by means of his death on the cross, and our hostility toward each other was put to death. He brought this Good News of peace to you Gentiles who were far away from him, and peace to the Jews who were near. Now all of us can come to the Father through the same Holy Spirit because of what Christ has done for us” (Ephesians 2:14-18). I repeat for emphasis: Now that’s new and so much better! And I ask again, “Wouldn’t you agree? For you see, there will NEVER be peace in this world between people, until there is first peace between man and God … only possible through a personal relationship with Jesus Christ. Change the heart of individuals, and the hearts of entire communities and nations will be changed. Not only did Jesus make permanent peace (reconciliation) between God and man, he also eliminated the old barrier between Jew and Gentile. Both Jew and Gentile who believe in and receive Jesus as personal Savior and Lord have become one NEW man (person) in Christ. Jew and Gentile … One in Messiah. Gentile and Gentile … One in Messiah. That’s the new way of it. And one day soon, this will be the rule, not the exception. As covered in last week’s Part I article, at the very moment that Jesus died on the Cross, the splendid Curtain that separated and protected the Holy of Holies was ripped in half. Some forty years later, the Temple itself and all Temple furnishings were utterly demolished by the ruthless Roman legions. Hundreds of thousands of Jews were mercilessly killed and most of the survivors scattered throughout the earth. The entire Levitical Sacrificial System ended. Yet, long before this tragic event took place, God’s glory (presence) left Solomon’s Temple, never to return, not even in the rebuilt Temple that stood from 516 BC to 70 AD. Nor did God communicate with his people, the Jews, in any fashion for 400 years before the birth of Jesus of Nazareth. Nor did they have a king during this period of time or since. How many signs are enough to accept the obvious: The Old Covenant was no more. The New Covenant had begun! Moreover, the Lord began to prepare his people for the coming Messiah during this 400 year silent period. By the time that Jesus was born, anticipation for Messiah was at an all-time high in Israel. As it is again in our generation. If you haven’t, please read Eye of Prophecy articles, Great Expectations for Messiah and Amazing Anticipation for Messiah. Posted 8-8 & 8-29-15, respectively. As indicated in those articles, just in this current generation and especially the past few years, nearly all Jews, including even the non-observant among them (secular) have expressed an amazing anticipation for the coming of Messiah. Just as they did in the immediate years before the birth of Christ. With Messianic Jews of today fully understanding (along with millions of Gentile believers) that, because Jesus is Messiah, it is his return that we so passionately long for. Thousands of 1st century Jews, followed by more thousands of Gentiles accepted Yeshua (Jesus) as Messiah and Savior; by doing so, they entered forever the New Covenant. But many more rejected him, which led to his crucifixion. Subsequently, that out-of-hand rejection of his Word (teachings) and his miracles then led to denial that he had arisen from the dead. A denial that absolutely contradicted all of the evidence, not the least of which was Jesus being seen by hundreds of witnesses after his resurrection. That denial has continued to this day, with one exceptional difference. In the 20th and 21st century, once again thousands of Jews all over the world have come to terms with the Lord their God, by recognizing that Jesus of Nazareth is who he claimed to be … Messiah, Son of God. By and large, they are referred to as Messianic Jews … because they are Jewish Christians. For a more detailed account, I would also recommend to you the Eye of Prophecy article, Messianic Jews … Who Are They? Posted 4-25-15. The amazing irony is that 1st century Christian Jews were not called Messianic Jews. There was no need for that appellation because there was no need to identify them as such in order to distinguish them from Gentile Christians. And the reason for that is that all of the first few thousand believers in Messiah Jesus were, in fact, Jews! Those believers came from all walks of Jewish life, including a good many Pharisees … the most notable of whom was the Apostle Paul. Later, all Jewish and Gentile believers were called Christians … Christ ones or belonging to Christ. They and believers today ardently acknowledged that the New Covenant foretold by Jeremiah was implemented by God the Father through his Son, Jesus. They believed and received the atoning sacrifice made not by animals, but by the human blood and body of Jesus, who is also God. They and we have believed the message of the Gospel of Jesus Christ. “…And that message is the very message about faith that we preach: If you confess with your mouth that Jesus is Lord and believe in your heart that God raised him from the dead, you will be saved. For it is believing in your heart that you are made right with God, and it is by confessing with your mouth that you are saved … Jew and Gentile are the same in this respect. They have the same Lord, who gives generously to all who call on him. For, ‘Everyone who calls on the name of the Lord will be saved’” (Romans 10:8-13, quoting Joel 2:32). 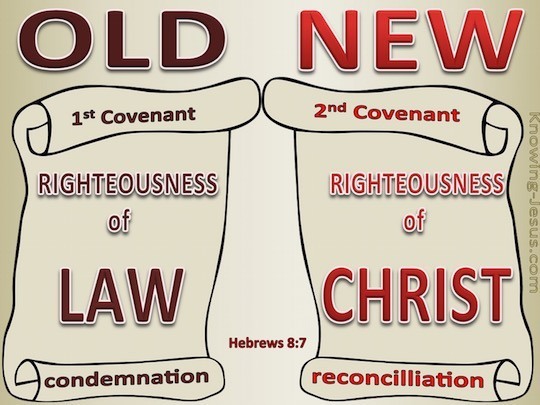 As begun in last week’s article, let’s examine a few more crucial verses from the New Testament book of Hebrews written by a Jewish author inspired by the Holy Spirit, to demonstrate how and why the New Covenant is superior to the Old Covenant. ‘You did not want animal sacrifices or sin offerings. But you have given me a body to offer. You were not pleased with burnt offerings or other offerings for sin. Then I said. Look, I have come to do your will, O God—as it is written about me in the Scriptures’” (Hebrews 10:1-7). Here, Jesus is quoting part of Psalm 40, which applies to the coming Messiah, written hundreds of years before his arrival on this earth. This is an utterly amazing announcement, because the sacrificial offerings were the cornerstone of atonement for the Hebrews. But, according to God, only because it was direct faith in and obedience to the Lord that made the burnt offerings (at that time) acceptable to him. If the Jews complied with the Lord’s commandments and regulations, but did so out of rote ritualism without loving obedience or a repentant change of heart and mind, then the sacrifices were unacceptable to God. “This is what the Lord of Heaven’s Armies, the God of Israel, says, ‘Take your burnt offerings and your other sacrifices and eat them yourselves! When I led your ancestors out of Egypt, it was not burnt offerings and sacrifices I wanted from them. This is what I told them: Obey me, and I will be your God, and you will be my people. Do everything as I say, and all will be well! But my people would not listen to me. They kept doing whatever they wanted, following the stubborn desires of their evil hearts. They went backward instead of forward” (Jeremiah 7:21-24). What most observant Jews and even many Christians who actually read and study Scripture forget or never learned in the first place is that Israel’s (the Jews) doing everything God instructed them to do was not a condition for atonement of sin (redemption). Rather the promised result of God’s people listening to and obeying him was entering, occupying, and staying in the Promised Land of Israel. Conversely, if they continually disobeyed the Lord (which they did for hundreds of years), they would be exiled from the land by their enemies. That’s exactly what happened to the ten northern tribes when they were conquered and expelled from the land by Assyria; then the southern tribes by Babylon. Finally and tragically, in 70 AD, the Romans completed what the Babylonians began. “If you listen to these regulations and faithfully obey them, the Lord your God will keep his covenant of unfailing love with you, as he promised with an oath to your ancestors. He will love you and bless you, and he will give you many children … You will be blessed above all the nations of the earth…” (Deuteronomy 7:12-14). And, “Be careful to obey all the commands I am giving you today. Then you will live and multiply, and you will enter and occupy the land the Lord swore to give your ancestors” (Deuteronomy 8:1). Yet, even if God’s people had loved, obeyed, and trusted him faithfully and constantly as a nation that would ensure their continued occupation of the land, there still would have been a need for individual and national sacrificial offerings to pardon intentional sins of disobedience and inadvertent transgressions throughout the year. Same is true of all people of all time. We’ve all sinned and the wages (penalty) of that sin is death, both physical and spiritual (Romans 3:23 & 6:23). Which is why all of the Levitical Sacrificial requirements were given separately to the people by Moses, as a matter of fact, foregone necessity. God knew and the evidence clearly confirmed this sad, but universal truth: None of his people, even the High Priest, could keep all of the Law all of the time. That was truly, Mission Impossible. Loving, serving, obeying, worshipping the Lord was conditionally vital to remain in this wonderful Land of Promise, but not ultimately for personal redemption. Individual and national faith (especially on Yom Kippur) in the atonement for sin by shedding the innocent blood of animals was the ONLY way to get right with God, i.e. salvation. And only then if their hearts were truly in the sacrificial offerings. But the Levitical system was only a shadowy preview, a pattern preparation of what would be the once for all redemptive sacrifice by Messiah Jesus to pardon our sins and to satisfy God’s justice for the penalty of those sins … Jew and Gentile alike. Then the Lord through Jeremiah states: “This is the nation whose people will not obey the Lord their God and who refuse to be taught. Truth has vanished from among them; it is no longer heard on their lips” (Jeremiah 7:28). Remember, Jeremiah was a prophet some 700 years after Moses. God’s patience is extraordinary, but not inexhaustible. It was time for change. It was time for announcement of the New Covenant. Jeremiah was God’s main prophet before, during, and a few years after the catastrophic Babylonian assault against Israel, resulting in complete razing of Solomon’s Tempe and exile to Babylon. This was the beginning of the end of the Old Covenant. Before the New Covenant began, it would be another 500+ years after the partial return of Jews to Israel from Babylon and Persia. Four hundred of these years included no communication from the Lord to his people, with the last prophet Malachi warning them yet again of consequences of rebelling against God. It was the same prophet Jeremiah who proclaimed the New Covenant that God, himself, would initiate with his people (and the whole world). The New Covenant that began when Christ shed his blood on the cross, thereby, dying for the sins of all people. With God’s only requirement: that of every man and woman to believe in the Son of God who sealed this Covenant when he rose from the grave, and receive him as personal Savior. “After supper he (Jesus) took another cup of wine and said, “This cup is the new covenant between God and his people—an agreement confirmed with my blood, which is poured out as a sacrifice for you” (Luke 22:20). In less than 24 hours after this last supper with his disciples, Jesus would, indeed, shed his precious blood on a cross to pay the debt (of sin) that we owe and the penalty that we deserve. This was all part of God’s majestic plan of salvation for the Jews first, then to the Gentiles. The only way the Jews could be a light to the Gentiles was through the very light of the world, Jesus the Messiah. The Old Covenant was broke, beyond repair. God’s people simply wouldn’t and couldn’t keep the requirements of the Law of Moses. Not in Moses’ time, nor Jeremiah’s time, not now. “…He cancels the first covenant in order to put the second into effect. For God’s will was for us to be made holy (set apart) by the sacrifice of the body of Jesus Christ, once for all time. Under the old covenant, the priest stands and ministers before the altar day after day, offering the same sacrifices again and again, which can never take away sins. But our High Priest offered himself to God as a single sacrifice for sins, good for all time. Then he sat down in the place of honor at God’s right hand” (Hebrews 10:9-12). Then, the author of Hebrews concludes this passage with, “And when sins have been forgiven, there is no need to offer any more sacrifices” (Verse 18). The Old Covenant couldn’t and didn’t take away sins; rather the sacrifices could only cover sins (temporarily). Accordingly, the sacrifices had to continue year around. What God really wants is complete love, trust, and obedience from a willing heart and an agreeing mind, one that is right with God. Although the shedding of innocent blood had to be done (because the very essence of life is in the blood), the ritualistic performance of these sacrifices ultimately could not clear one’s conscience nor change one’s heart. That’s why the Levitical system was instituted in the first place: To (temporarily) pardon the very sins caused by an innately sinful nature, a hardened heart, and a defiled conscience. With the New Covenant, God put the proverbial horse before the cart. First, change the human heart through complete forgiveness of sin and promise of everlasting life; then loving obedience and trust would follow—through a divine legal pardon that gives us right standing with God, as well as intimate access into God’s presence (the most Holy Place). Ever so sadly, Jews in Judaism, Catholics in Catholicism, Mormons in Mormonism, Muslims in Islam, and the many who follow other man-made religions or cults simply won’t and don’t accept the crystal clear Biblical plan of salvation. Which is a free gift (Savior) from God; not a system of repeated sacrifices, good works, or keeping of regulated rituals. It was God doing for us what we were incapable of doing for him or for ourselves. The Lord gave the Jews hundreds of years of the Old Covenant to prove to him and themselves that they could and would successfully follow him and keep his commandments. They didn’t and couldn’t; thus, the New Covenant was necessary. “With his own blood—not the blood of goats and calves—he entered the Most Holy Place once for all time and secured our redemption forever. Under the old system, the blood of goats and bulls and the ashes of a young cow could cleanse people’s bodies from ceremonial impurity. Just think how much more the blood of Christ will purify our consciences from sinful deeds so that we can worship the living God. For by the power of the eternal Spirit, Christ offered himself to God as a perfect sacrifice for our sins. That is why he is the one who mediates a new covenant between God and people, so that all who are called can receive the eternal inheritance God has promised them. 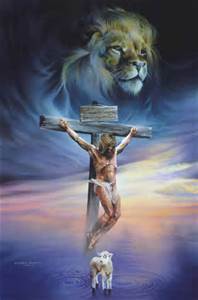 For Christ died to set them free from the penalty of the sins they had committed under that first covenant” (Hebrews 9:12-15). Tragically, by rejecting so great a sacrifice that produces so great a salvation will eventually end with (as Jesus said) so many people dying in their sins … eternal separation from God. The torn curtain was more than symbolic; it was a literal transitional tearing away from the Old Covenant to the glorious life-changing, eternal destiny-altering new way to and right-standing with our Creator and Savior. “…we can boldly enter heaven’s Most Holy Place because of the blood of Jesus. By his death, Jesus opened a new and life-giving way through the curtain into the Most Holy Place. And since we have a great High Priest who rules over God’s house, let us go right into the presence of God with sincere hearts fully trusting him. For our guilty consciences have been sprinkled with Christ’s blood to make us clean, and our bodies have been washed with pure water.” (Hebrews 10:19-22). Not only was the curtain torn in two, it’s now gone. As is the Ark of the Covenant, the Menorah, all other instruments in the Temple, and most of all, the Temple itself. Why did God’s very presence, the Shekinah Glory, abandoned Solomon’s Temple? Why did that Glory not return (save for a few years when God’s glorious Son taught and healed in the Temple)? Why did the Ark of the Covenant on which the annual Yom Kippur sacrificial blood was sprinkled disappear from the Most Holy Place, never to be found or returned even to Herod’s Temple? Why did God no longer speak to Israel through prophets after the last prophet Malachi? (That is until John the Baptist paved the way for Messiah Jesus)? How was it possible (a mere coincidence?) that the huge, thick inner curtain of the Holy of Holies tore in two at the very moment Jesus died on the Cross? Where’s the 2nd (Herod’s) Temple? Why was it also destroyed? (Think beyond the obvious answer that the Romans destroyed it to crush the Jewish revolt). And, perhaps most poignant and penetrating of all: Knowing that the God of Israel mandated full compliance to not only the moral and civil laws of the land, but also faithful keeping of the Levitical Sacrificial system, how then is it possible to receive atonement for sin without the daily, monthly, and annual shedding of innocent animal blood? Could it be that the New Covenant promised by God through Jeremiah has been put into place? All who call on the name of the Lord. Is it the Curtain that leads to the Holy of Holies? Or is it the Cross of Christ that gives access to the Most Holy Place, the very Presence of God? It has to be one or the other. Else there is no hope for redemption. One day soon, the amazing national restoration of Israel will take place when that same Messiah returns in great glory and power to preemptively rescue Israel from destruction at the hands of their enemies. “I want you to understand this mystery, dear brothers and sisters, so that you will not feel proud about yourselves. Some of the people of Israel have hard hearts, but this will last only until the full number of Gentiles comes to Christ. And so all Israel will be saved. As the Scriptures say, ‘The one who rescues will come from Jerusalem, and he will turn Israel away from ungodliness. And this is my covenant with them, that I will take away their sins” (Romans 11:25-27, quoting Isaiah 59:20-21). “This means that anyone who belongs to Christ has become a new person. The old life is gone; a new life has begun! And all of this is a gift from God, who brought us back to himself through Christ…” (II Corinthians 5:17-18). “For God made Christ, who never sinned, to be the offering for our sin, so that we could be made right with God through Christ” (Verse 21).